1. Light all the candles. I love this because a simple flame evokes such a sense of warmth. We typically have candles on hand. And if we don't, I can grab a pretty one pretty much anywhere. TJ Maxx is my favorite for pretty candles that look more expensive than they are. 2. Textural and deep-hued pillows. 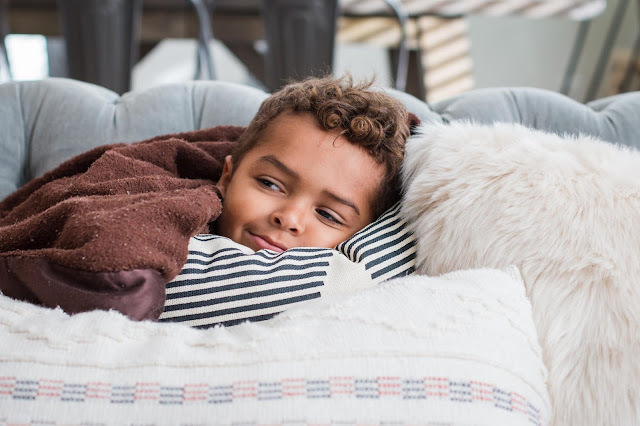 Swapping your usual pillows for velvet, fur, or knit ones is just so cozy. 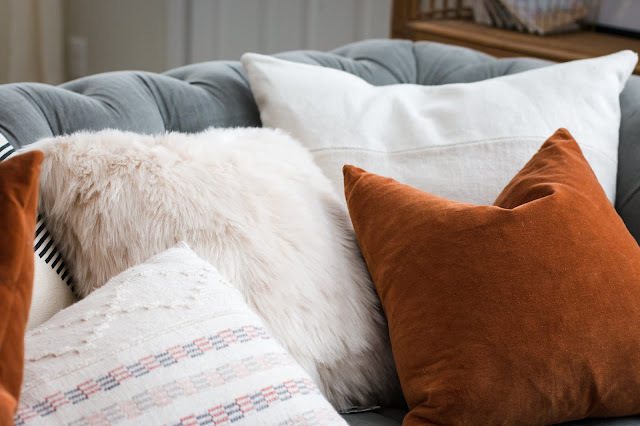 If you choose neutral pillows with fun textures (vs. "fall colors" that you might tire of), you can pull them out year after year. 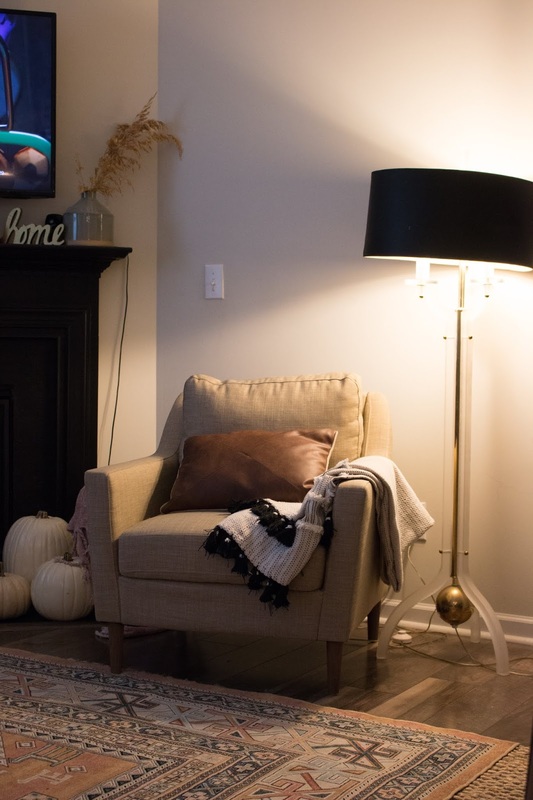 Then again, choosing a deeper hue of a color you love is perfect for fall. 3. Wax burner. 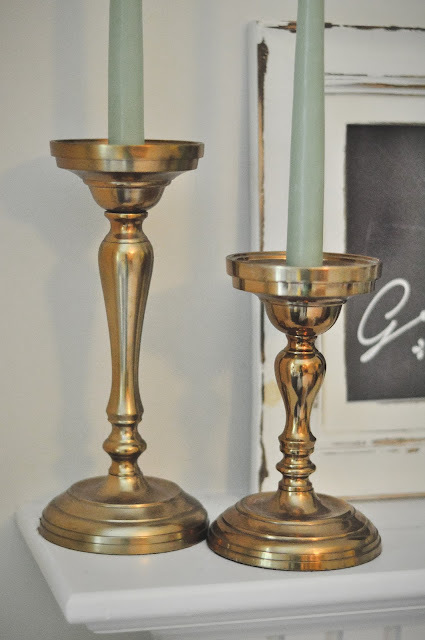 While I love candles, I really love the carefree-ness (is that a word?) of wax warmers. You don't have to worry about the meddler in your family burning the house to the ground and you can find wax to melt almost anywhere. Wal-Mart recently started carrying Yankee candle melts and they are SO good. 4. Lamps. You probably already have them. But do you remember to turn them on? Maybe you do and this is a silly tip, but I often forget until just before bed. I've been making an effort to go around the house around dinner time and turn on all the lamps, the Scentsy, and light a candle or two. It makes such a difference! Whenever I remember this little ritual, Joe always comments on the vibe when he gets home. And bonus--low lights camouflage the mess. You know, for my friend who can't keep her house clean. ahem. ahem. 5. Warm apple cider, hard cider, or apple pie wine (it's a thing!). Okay so this isn't so much about your home, but offer your kids or your guests a fall drink when the season hits. Rather than Coke or water, why not have cider on hand? My husband just came across this and I can't wait to try it (he sampled it and told me all about it and it's just now occurring to me, um, why didn't he bring a bottle home?! haha). 6. 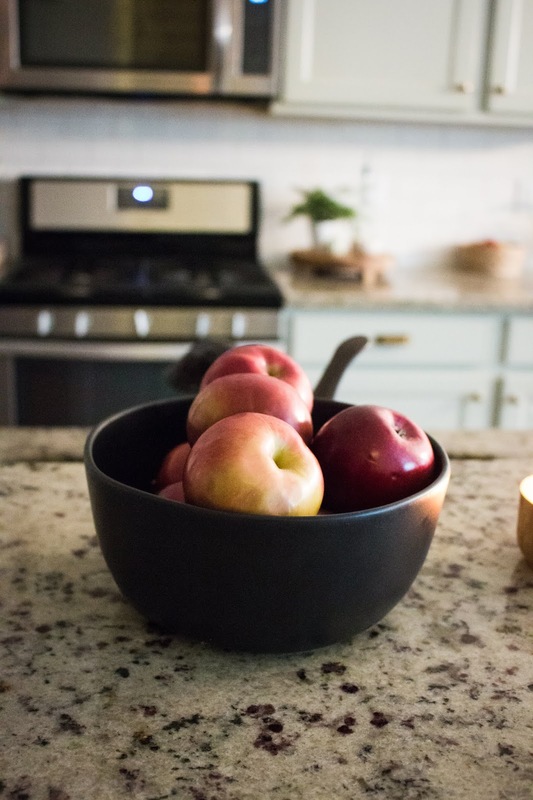 Apples or oranges in a bowl. We usually have a variety of fruit in a basket but adding a basket or bowl of apples to your entry table or dining table is an easy and practically free way to infuse a fall vibe. Here are some similar items if shopping your house doesn't yield results. ;) Affiliate links are included. What did I miss? 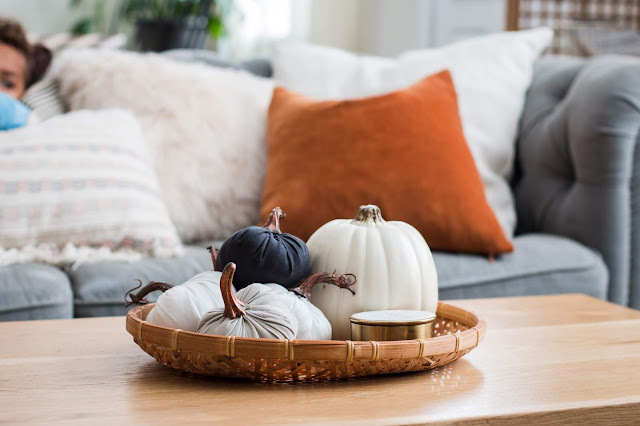 I tried to focus on simple tips we might overlook (like obviously put pumpkins everywhere and decorate your porch!) and the little things I forget to do. 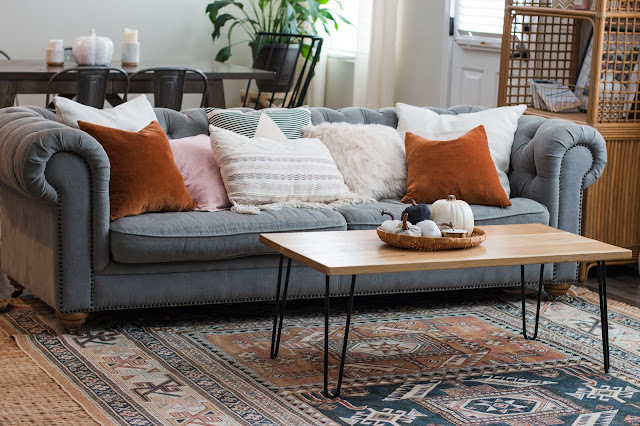 But what else creates a cozy fall vibe?! Would love to hear your tips!